David Letterman has hosted "The Late Show" since 1993 and announced his upcoming retirement from the popular late-night talk show last year. As of May 20th, 2014...he has officially retired now from the CBS Late Show with David Letterman. He was a pioneer of late night TV and will be missed! The show was nominated for 72 Emmy Awards and has won 9 of them of the years. 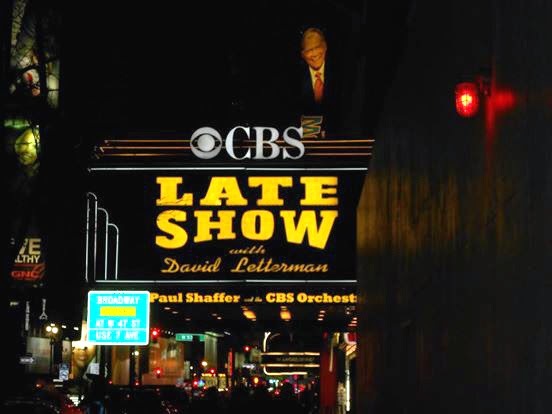 Out of all of the "late night" talk shows, "The Late Show" with David Letterman has always been one of our favorites. We love it when David does his "Top 10 Lists" which are always super funny! Every time we visit New York City we always made sure we stopped by for a tapping of the show. Since the show has now come to an official end, we wanted to feature it as our travel "Photo of the Week" here on our blog. Thank you David Letterman for all of the laughs and smiles you brought all of your viewer's faces every time they tuned it to watch your show. You will be missed! They just took the Maruis sign down toy. David Letterman will definitely be missed. I still miss Johnny Carson! I rewrote my comment because words were misspelled. Today they took down the Marquis sign of the David Letterman show.